Dragon Breathing message of my own…..
Blow away this winter staleness…this space of holding hostage thoughts that impede honest imaginings and new beginnings from their bloom. Help us bring freshness, kindness, and compassion back into our lives. Let there be clear skies, clear minds for us to see our way. Let our songs and words create safe, open space, that lift our hearts in shared community. Free us from anger, Free us from captivity and compliance that does not serve. Free us from frozen, ignorant drama. I’ve been trying to mind my manners and keep my mouth shut for a good long while about the state of affairs with my dear Little Artshram, non-profit organization, has endured in a “thrown under the bus” kind of public beating. The last few days have been spent polishing up my slimed, angered and tired-out self from the past 8 months of BS associated with creatively responding to the need for and building of a safely constructed and sanitary, compost toilet. 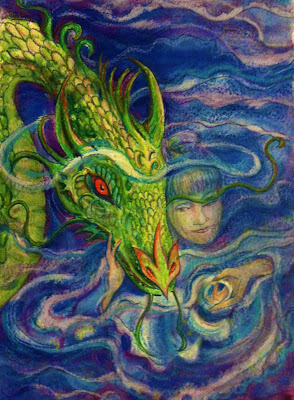 I’ve taken two self-help steps: First, I went back to my drawing board and painted this Dragon of the North and Quan Yin illustration; rewriting the invocation a bit. AND, this morning, I listened to a group discussion, led by Judy Rebick, author of Transforming Power, about the Occupy movement via Michael Stone’s podcast, for which I’ve attached a link below. I don’t feel that I have the articulation skills or the desire to speak to on-going, stagnant TV News or to local newspaper reporters who have experienced a long winter, of slow news opportunities, for a quick chat. I’m of the emotional and epic nature/type of public speaker. Especially now, I don’t trust that I could speak without using colorful language. I mean no disrespect to anyone personally, but the media, political, and economic system they remain connected to, I’ve lost respect for, and need to keep stepping away from. It’s making me feel confused and unhealthy, as they don’t give anything back. They just drain my precious system—which includes my artist-gardener-teacher-mother-woman-heart. At this time, as far as statements or convos of any consequence, my blog and Facebook is the way to go…so…. I thought I’d share this at least with my blog readers and with my FB friends, a wonderful way to compost this important and silly bizness by remembering the ways in which we can create a new way of being on public owned land through an example of the Occupy Movement. The truthful and big stink raised about our compost toilet is truly about perception rather than reality; an interpretation of communication rather than truthful listening/speaking; concern about greenbacks rather than valuing sweat equity. The last 8 months of this local front-page story, in Traverse City, has been about fear and very sad people trapped in hopelessness; and also, the awesome spirit of power that YES even in terms of how we occupy public land that smart facilitation, includes people and scrappy little organizations, that have faith that we can responsibly solve our own problems. And, that we can do so with creative, decisions—based on principals and ethics for people care, earth care and giving something back. YES, applying compost to a non-food producing garden IS giving something very, very good back. I’m greatly disappointed and deeply hurt to have to compromise with the Rec Authority’s condition for this agreement, which is to not hold our Little Artshram classes and programs (children and youth under the age of 18—which IS the center of our mission and work) on the barns property. Especially because of the over-powering pressure and fear tactics of a system that has needed and prospered from our presence, and that of the children and families we’ve served. We will be holding our Summer Camps elsewhere, with the same curriculum based on permaculture in 2012. How ever Little Artshram and I may be portrayed or whatever interpretation you may have….I sincerely, invite everyone to get a grip and get centered in this beautiful, real world. This has been tough to do with all the hoop-jumping over the past 8 months, for the Little Artshram board and myself. But it has not been accomplished without an incredible amount of thankful, THANKFUL help and SUPPORT from so many people in our community….and we have proven we are capable. Time is passing swiftly…and I join others in asking that we keep waking up, and composting the BS that keeps us stuck. That we recognize where we all are in this percentage-like-metric-based-who has what and how much society. I pray we keep re-thinking and re-building a system and life-style with love, kindness, gifting and sharing with each other and learnng to let go, let go, let go, when we know it’s not working.